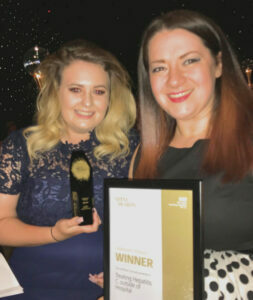 On Friday 11 July the work of Forward Leeds was recognised as part of the Leeds Teaching Hospitals Trust (LTHT) Time to Shine 2018 awards. Time to Shine is an annual event that the Trust holds to recognise and celebrate outstanding work. The Award for Collaborative Working was given to the LTHT Hepatology Department and partners, which includes Forward Leeds, for their work in combatting hepatitis C across the city. Forward Leeds now screens and can offer treatment for hepatitis C at all of its hubs in Leeds in partnership with the LTHT Hepatology Department. The provision of this hepatitis C service has been redesigned by the LTHT Hepatology Department in consultation with partners including Forward Leeds. Hannah continued: “The benefits of our work with the Hepatology Department can be felt all around Forward Leeds. What was once a fearful conversation to have with clients, is now, although somewhat scary, more positive, hopeful and allows clients to believe in their successful chances of treatment”.